What to know: Simple animation that disguises lessons of friendship and sharing into such a cute little story. 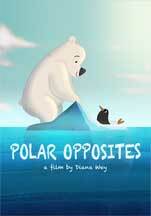 Polar Opposites is a charming little animation about a grumpy penguin and a friendly polar bear. The penguin does not want to share his ice or food. It is quite fun to see this big kid of a bear invading the grumpy penguin's space and snatching his food. When the penguin has finally had enough of the bear's behavior he separates the two from the ice they were resting on. The two have such distinct personalities that are portrayed without any dialogue, only background music. I love simple animations like this that disguise lessons of friendship and sharing into such a cute little story. I could see this developing into a longer film. The ending resolution is quite satisfying. The characters are cute, funny and engaging. The storyline flows well. The 2D animation is well executed with surprising close ups that delight you. The background music perfectly portrays their various emotions. I highly recommend this for the KIDS FIRST! Film Festival. It is exactly the type of film we love to share with our audiences. It tells a wonderful story about sharing and friendship, showing that even polar opposites can find common ground (or ice). I recommend this for ages 4 to 10, as well as adults. Reviewed by Rachael V. and Julie S., KIDS FIRST! Adult jurors. A grumpy penguin flees his colony to be by himself, but has to protect his iceberg from a friendly polar bear who wants company.